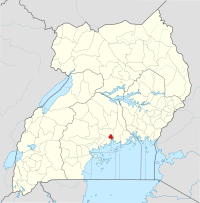 The Kampala–Mityana Road is a road in the Central Region of Uganda, connecting the capital city of Kampala to the town of Mityana in Mityana District. The road begins in the Busega neighborhood, in Lubaga Division, northwestern Kampala. It continues through Buloba, Bujuuko, and Zigoti, to end at Masaka, a distance of approximately 60 kilometres (37 mi). Prior to 2009, the road was gravel surfaced, in poor condition. As far back as 2003, the government of Uganda planned to upgrade the road surface. In 2009, work to upgrade the road surface to grade II bitumen class, with shoulders, culverts and drainage channels. The road was divided into two sections: (a) Busega–Muduuma, measuring 27 kilometres (17 mi), was contracted to Spencon Services Limited with Stirling Civil Engineering Limited (b) Muduuma–Mityana, measuring 30 kilometres (19 mi), was contracted to Dott Services Limited. Lea International Limited (Canada) was the supervising contractor for both sections. The road was successfully completed in 2012. ^ a b UNRA (2009). "Uganda National Roads Authority: Kampala–Mityana Road (57Km)". Kampala: Uganda National Roads Authority (UNRA). Retrieved 19 February 2016. ^ GFC (19 February 2016). "Distance between Busega, Kampala, Central Region, Uganda and Mityana, Central Region, Uganda". Globefeed.com (GFC). Retrieved 19 February 2016. ^ Wamuttu, Samuel (29 July 2003). "Uganda: World Bank to Fund Mityana Road Works". New Vision via AllAfrica.com. Kampala. Retrieved 20 February 2016. ^ Twinamatsiko, Nicklison (18 August 2014). "Why foreign contractors dominate the high-end market". Kampala: Concreteideas.ug. Retrieved 20 February 2016. This page was last edited on 8 August 2017, at 13:13 (UTC).